I finally had a chance to start on my corset! I started by comparing the Laughing Moon Underbust corset pattern with the pattern from the Japanese corset book. 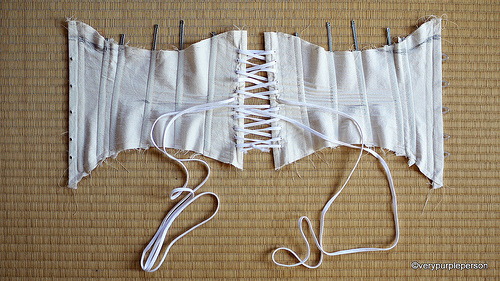 The Japanese corset pattern is very simple with only four pieces: front, side front, side back, and center back; while the LM pattern has six pieces with four of them are side pieces. I think it means that the LM pattern has more room for body curves, so I decided to go with the Laughing Moon. I’ll keep the Japanese corset book for ideas and inspiration though as the pictures are so pretty. The instructions for this pattern is quite clear and I didn’t have much trouble constructing my muslin. 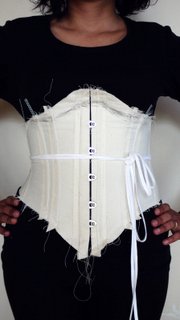 I also referred to Corset Making e-book by Julia Bremble from Sew Curvy. I bought the book as downloads from Vive Books though, Sew Curvy only has the CD version. As my size is between 8 and 12, I cut the muslin in size 12 so I can take them in later if needed. The muslin didn’t have proper eyelet for lacing yet, they are just holes made with an awl. I installed the front busk quite properly though, as an exercise for the real thing. The spiral steel bones in Laughing Moon kit came as a roll that needed to be cut first, fortunately I have several spiral steel boning that I bought a long time ago for my unfinished bombshell dress (-_-;) so I used them for my muslin. Here’s the corset muslin on my body! From my corset newbie point of view, I think it looks quite alright. 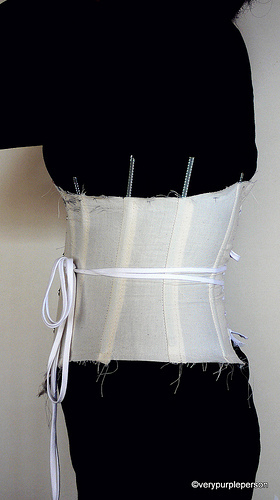 A corset is supposed to have a two-inch gap at center back, mine is about 1.5 inch. Maybe I should take it in a bit. I’m still not sure, will do more research. The fit under the bust is a bit too high so I drew a new line that will be transferred to the pattern later. You can also see the asymmetry because of my scoliosis. The right side of my waist has more ‘nip’ than the left side. I’m not sure if it means that I need to make each side of the corset differently. As for the comfort factor, surprisingly it is not as uncomfortable as I thought. I can walk and sit without feeling uncomfortable. In fact I kinda miss it when I had to take it off. Of course I’ve only worn it for a short time only so we will have to see again later. 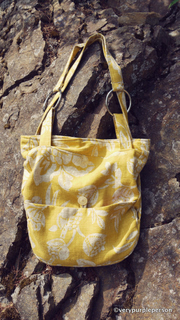 So far I’m quite happy with the muslin and can’t wait to start on the real thing! 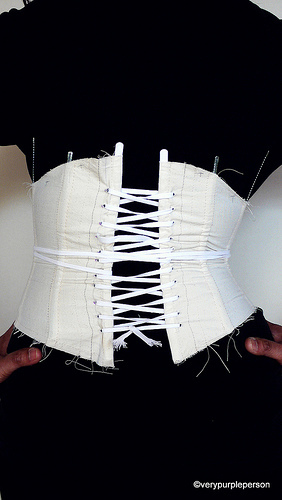 But I want to be really careful and not rushing this project, I don’t think I will make too many corset for myself!